A few months ago, I started Jinny Beyer's 2015 Block of the Month quilt through Craftsy. I watched Jinny's class on templates and perfect hand piecing and said, "I've been quilting for 30 years and can quickly piece these blocks without all of the fuss!" I made the first block. I wasn't thrilled but I continued on. I made the second block, again underwhelmed. I attempted blocks three, four, and five and was ashamed of my blocks. Then I decided to do what the teacher suggested. I ripped out all of my blocks and started making them the way Jinny suggested. I am hand-piecing with WonderFil Konfetti K200 Black thread and a size 7 embroidery needle. I am finally enjoying making this quilt! 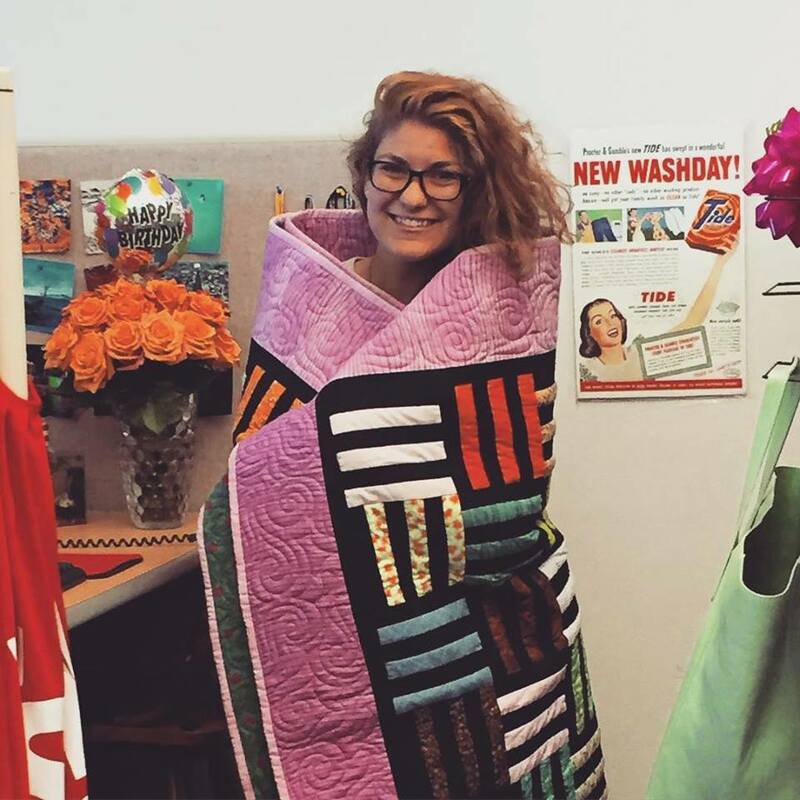 If you receive my newsletter, you've already seen my latest More or Less Quilt, In the Pinks, but I want to tell you more about it here. I am working on a series of quilts that I call More or Less. Every time I finish a quilt, I decide if there should be more or less of some element (color, pattern, etc.) in the next quilt. Then I make the next quilt incorporating that change. And do it all over again. And again. And again. I used a not-yet-released thread from WonderFil called FabuLux. I was tickled pink (did you see what I did there?) to design this thread line and had to have variegated pink spool in the line! Bonus points if you notice the Hello Kitty fabric for the backing! I think it's a much cleaner transition and I'm glad that I made the change. 1. What would you do differently in Quilt 3? 2. Should I continue filming videos about each pair of quilts? Cut the Scrap -- Cuties! Do you have any fabric in your sewing room? A little? A lot? If you are anything like me, you have no "room" in your sewing room because it is full of fabric. I have a decent system for storing yardage, kits, and in-process projects in my sewing space, but I am overrun by scraps! A basic philosophy of my life is that I like to do a minimum amount of effort and see a maximum amount of results. This hardly ever works, but when I try to manage my overflowing scrap bins I pull out the largest pieces first and try to cut them into chunks that are 9"x22" (fat eighths). I roll them into little bundles and call them Cuties. I see a lot of black and white Cuties in that drawer that will probably turn into a quilt soon. I design patterns for the Cutie Collection (patterns that use 16 fat eighths) and use my scraps to test patterns and make scrap quilts just because I like them. How about you? Do you have scrap pieces large enough to cut fat eighths? Which Cutie Pattern might show them off best? Cuties As Far as the Eye Can See! I'm at Quilt Odyssey in Hershey, PA this week with my friends at Quilt Basket from Pawling, NY. This shop is the home of the Cutie Collections fabric packs and Cutie Patterns. We set up the booth yesterday afternoon and there are over 20 different Cutie Quilts hanging and every Cutie Pattern is in the booth. It's Cutie Heaven! Will I see you at the show this week? I love this week's quilt. I really, Really, REALLY love this week's quilt. Did you notice that I snuck more ribbon candy into the black inner border? I even filled those ribbon candies with double loops. I am hopelessly addicted to ribbon candy! I stitched simple swirls in the outer border since the quilting wasn't going to show much. Can you guess why I named this quilt "Irresistible"? A. I can never resist Ribbon Candy quilting? B. I can't resist using lovely thread? Have you ever been drowning in fabric? It may be a happy way to go, but sometimes I'm overwhelmed by the amount of quilts I have unstarted, in process, or in my drawing pad. How will I ever finish them all??? My Fabric Acquisition is no longer Beyond my Life Expectancy*. I'll be forever young and will be able to quilt forever! *FABLE = Fabric Acquisition Beyond Life Expectancy. New Cutie Pattern -- Sweet Tooth! I am so thrilled to finally share a new Cutie Pattern with you! Ok, so it's not new but it is freshly back from the printer. I published this pattern years ago and recently re-worked it to use 16 fat eighths of fabric so I could make it with all of the wonderful Cutie Packs! I'm treasuring each inch of leftover fabric, and by using a Cutie Pack, there weren't many inches left over! Shocking no one, I quilted a lot of ribbon candy into this quilt. That's what makes it so sweet! If you want to see the original Sweet Tooth pattern, you can see it HERE. This week's quilt is the sample I made from the new FabuLux thread I designed for WonderFil Specialty Threads. I stitched ribbon candy in the green stripe. If you know that ribbon candy is my favorite quilting pattern, you will say, "Of course you did!" This quilt is all bound and I am pretty thrilled with it. I love how the thread blended into the green fabric, showed up as green on the white fabric, and nearly looks like gold metallic on the black fabric! 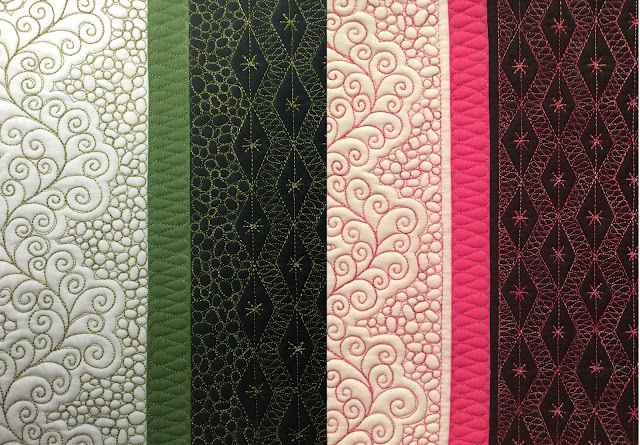 It's hard to believe that this piece was quilted with only one color of thread. I can't wait to get started on the next FabuLux sample! I was so excited to write this post about my trip to Little Foot Quilt Shoppe in Evans City, Pennsylvania. I wanted to show you their cute shop, their Steeler fabric (Go Black and Gold! ), and the fabulous students. Imagine my surprise when I discovered that I was too busy having fun to take any photos of this event. The Horror! I'll have to show you some quilt photos, instead. Sarah and I did a quilt exchange while I was at the shop. Each quilt teaches me something new. This quilt taught me that So Fine blends well. I used olive, tan, and dusty purple thread on this quilt. You might think that the lighting makes it difficult to see the thread color changes, but that isn't it. You can't tell in person, either. Are you visiting the Row by Row Experience shops? Have you been to Little Foot Quilt Shoppe yet? I can't wait to go back. Next time, I hope to actually take photos! There have been periods of silence on this blog recently as I worked on projects that had to remain secret for a while. Today, I can share another one of my secrets! I am excited to unveil my newly re-done website: Debbybrownquilts! Check back regularly because the collection of quilts in the Gallery is subject to change without notice. On my website, you can see if I'll be teaching at a quilt shop, guild, or show near you on my Events Page. 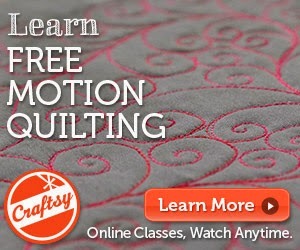 Or you can just find a discount link to my Craftsy class. If you have questions about the links that are marked Coming Soon, I will answer with a "Patience, Grasshopper." I remain hard at work planning more surprises. Everybody wish Zoë a Happy Birthday! If you want to have Zoë or one of her co-workers help you with your website and marketing needs, Contact Me for a link for a free trial! Recently I started a new project. My Facebook (Debby Brown Quilts) and InstaGram (debbybrownquilts) followers have seen what I've been doing and now I want to show you! I have been playing with my new thread, FabuLux from WonderFil, and I started with a spool of Olive Trees. My HQ Sweet Sixteen, Hazel, and I had so much fun playing on this little quilt! I will reveal the finished quilt in my newsletter tomorrow. I have a new feature in my newsletter called More or Less. 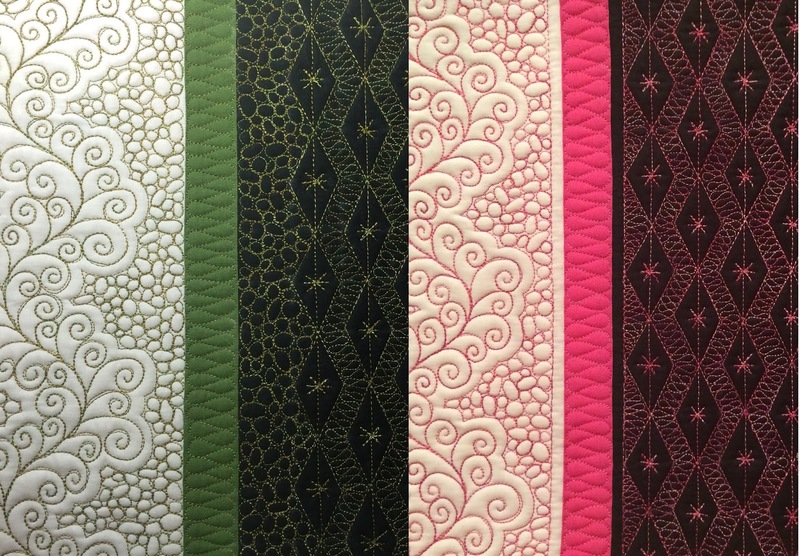 It's about quilting design. Have you ever finished a quilt and been mostly happy with it but thought, "If I were to do this again, I'd change this one thing"? Well, I am doing a whole series of quilts and each time I'm changing that one thing. I have no idea where this project will take me but I'm excited for the journey. If you want to follow along, sign up for my newsletter HERE.